A major pharmaceutical company was seeking to improve their fire safety systems. They were currently using either fusible plugs or plastic tubing on their automated valves. The fusible plug/plastic tubing would melt under high temperatures venting the valve actuators and sending the valves to their fail positions. Their onsite fire department, comprised of plant personnel, was concerned that this system was a safety issue under fire conditions. When the fusible plug or plastic tube burns, it feeds the fire with an air source putting the responding fire crew in greater danger. Plant engineers called Assured Automation as they had successfully used their automated valves and flow meters for previous jobs. Assured Automation’s product specialist suggested they use the FireChek heat activated pneumatic shut-off valve to quickly shutoff pneumatically operated valves during a fire. 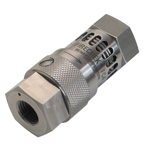 FireChek is a heat activated emergency shut-off valve utilizing shape memory alloy that responds to heat to activate, venting pneumatic actuators during an upset condition. When FireChek senses excessive heat from a nearby fire, it immediately vents the pneumatic actuators downstream of its location, while closing off the upstream air supply. This shutoff of the air supply starves the fire compared with fusible plugs or plastic tubing which feed the fire if burnt through. The employee fire team quickly specified the FM approved FireChek as their new product of choice for venting automated valves under fire conditions. They liked that the Firechek offered a manual reset, which allows for routine performance testing for their safety maintenance program. A hot air gun quickly actuates FireChek, after cooling briefly, the FireChek can easily be reset without the use of tools. This entry was posted in Emergency and Fire Safety Valves and Devices, Latest News, Pharmaceutical and tagged Emergency shut off valve, Fire Safety, FireChek, Heat Activated emergency shut off valve. Bookmark the permalink.